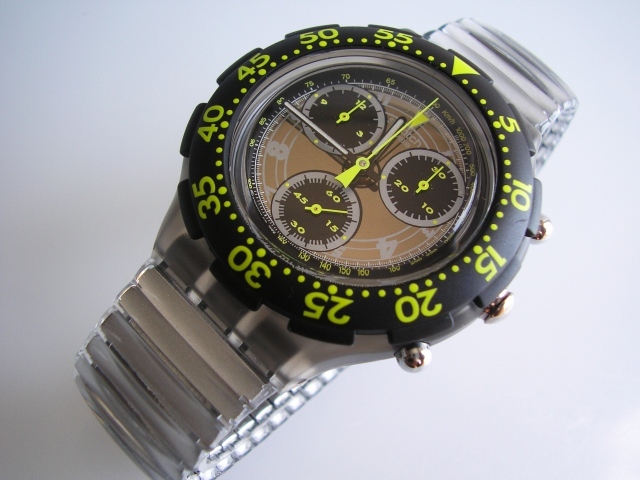 The Swiss obviously needed to fight back against Seiko's take-over of the lower end of the lucrative chronograph market. 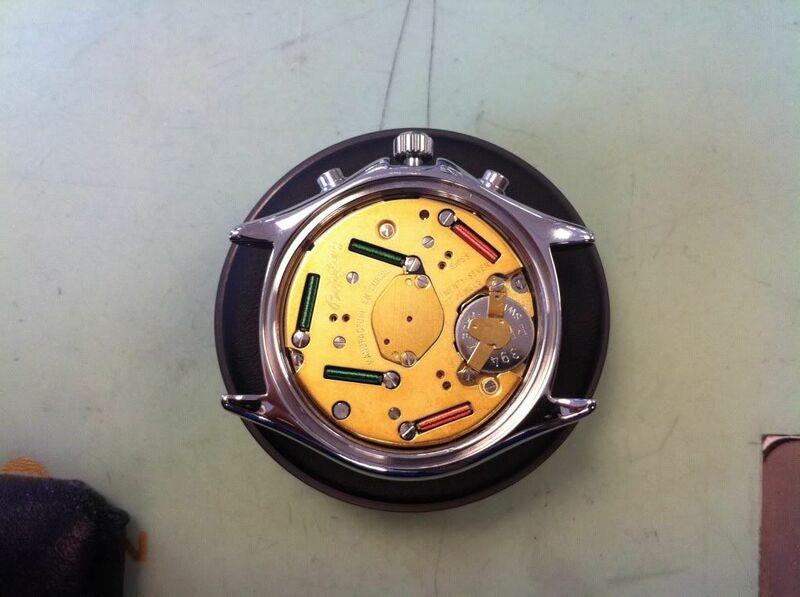 Their answer to Seiko's 7Axx family of 15J movements came in the form of ETA's Cal 251.252 / 262 / 272 27J and 22J calibers. Warning: these files are not exactly small and clicking on the individual links automatically starts a download. 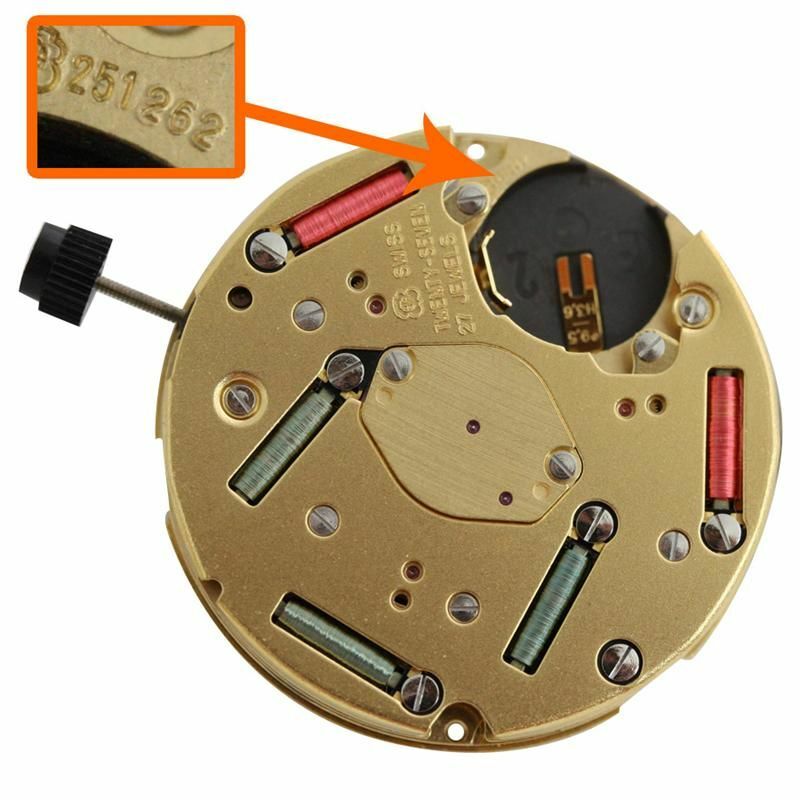 Whereas their equi-distant sub-dial (and optional date) layout is very similar to the Citizen 35xx calibers, those had multiple pushers (and crowns); the actuator layout on watches using these ETA 251.2x2 calibers is simpler and more conventional, with two pusher buttons above and below the crown on the right hand side. 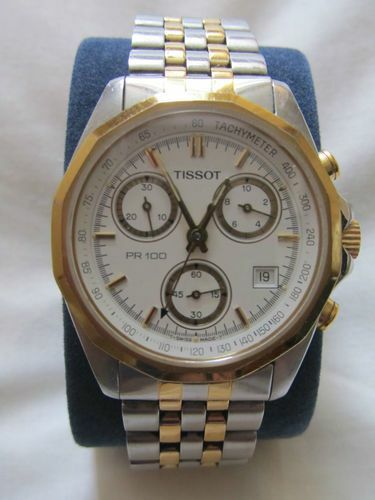 My first sighting of a watch using one of these calibers was an early 1990's Tissot PR100 belonging to a work colleage, 3 years ago. Like myself, he used to replace his own batteries, and we joked about each others' watch's jewel content - 'only' 15J versus his 22J. 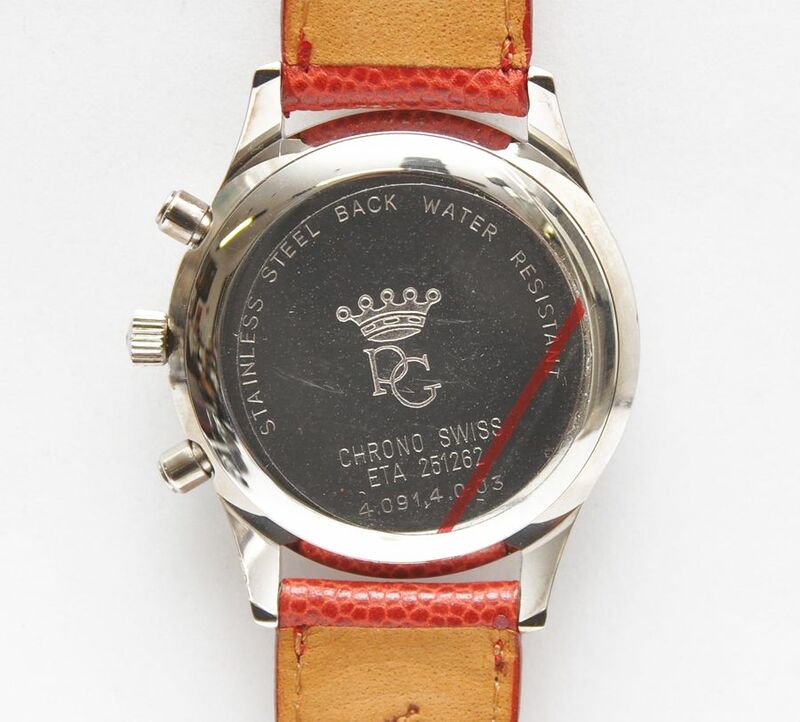 I think what I liked most about the dial layout was the 'correctly aligned' date window at 4 o'clock, which is due to the day wheel lettering being printed 'askew'. Most other watches you'll see using the same ETA Cal. 251.272 movement have an angled day window @ 4:30. 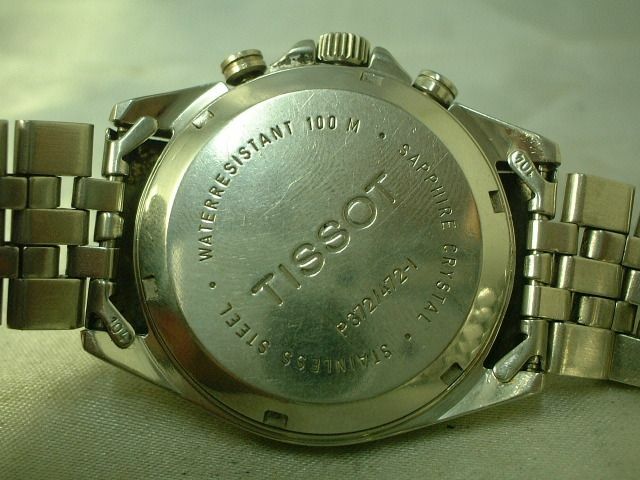 The original Tissot PR100 design came in a number of different dial colours: including black and blue and also in two-tone finishes. I've even had a PR100 on my eBay watching page within the last week or so, but accidentally deleted it, making room for other stuff. Found it again. It was this stainless / black dial in Germany. I'd actually bid it to 45 Euros, then either gave up or totally forgot about it. 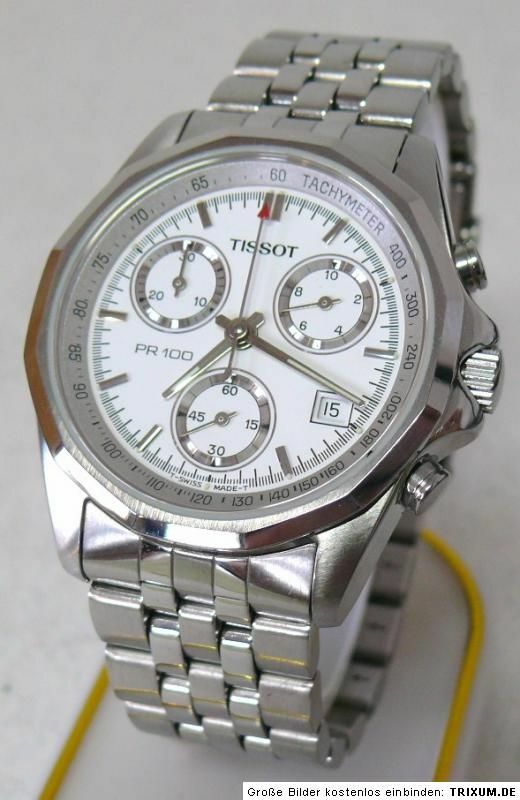 http://www.ebay.co.uk/itm/Tissot-PR-100-Chronograph-/171041536872 .... It sold for 83 Euros. 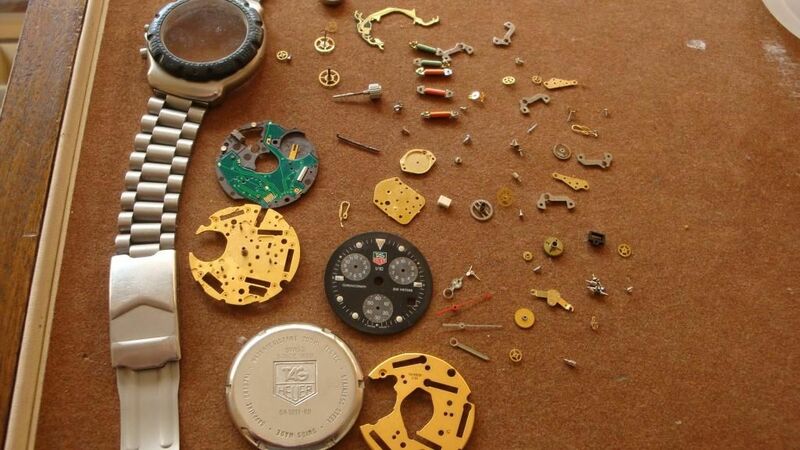 Whereas that watch and its movement may now be well beyond economic redemption, the quality of the components is clearly evident. If you zoom in on the backplate of the Cal. 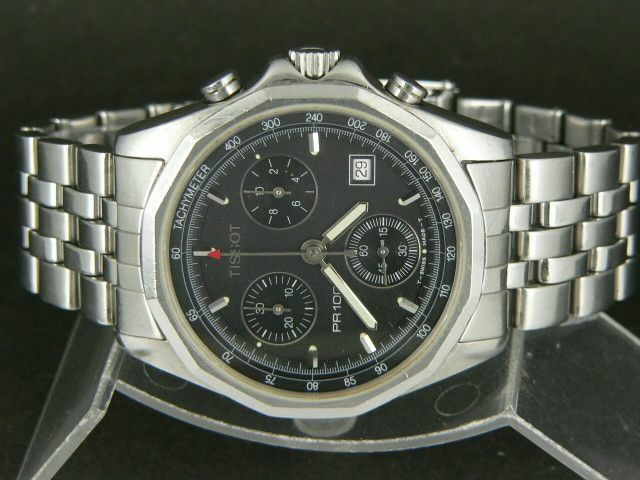 251.262, you'll see it's stamped TAG Heuer. 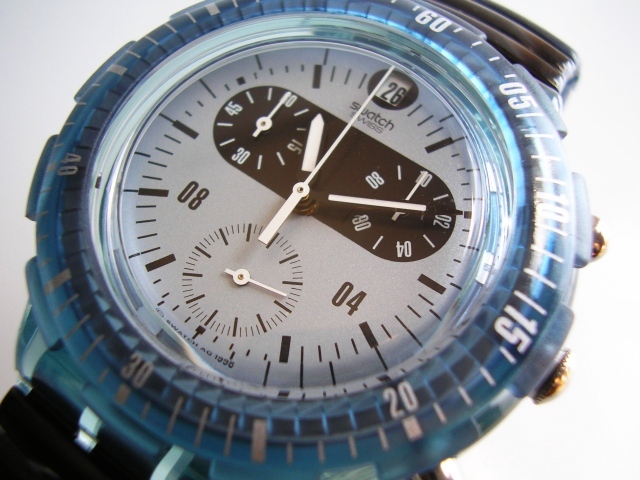 ETA are a movement supplier to other watch manufacturers. Like Citizen / Miyota, where the OEM requires it - and pays a premium, the movement will be re-branded accordingly. That makes me feel a little better over my so far unsuccesful attempts to get the main bridge back on my 7A38. 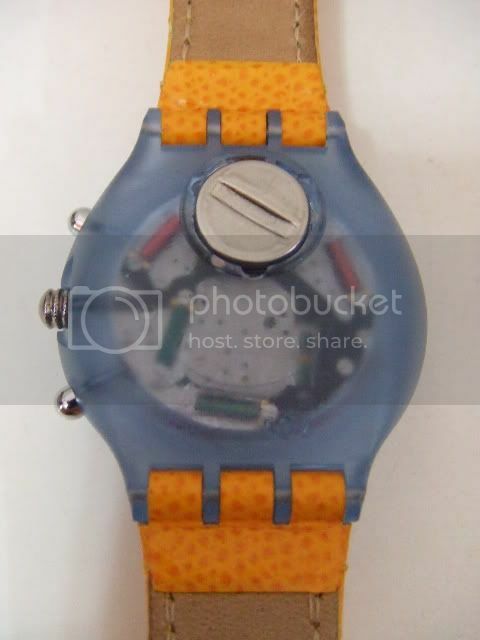 I saw this thread I thought hang on, they look very similar to my Swatch AquaChrono's... Sure enough, looking through the transparent case it's basically the same 22 jewel movement, at least in less dressed-up form with plain steel parts. With an eye-piece you can just about read the calibre of 251.282 in the same location. These offer timing to the second up to 12 hours. Below is the first design I got in 1995 and wore almost exclusively for 8/9 years. I then got four more NOS/mint models off eBay in 2004/5. I'm far from a collector though as 90% of designs are far too jazzy and childish! The plot thickens when I looked at my single late 90s model, it has a totally different 4 jewel ETA movement offering date and 1/10 sec timing but only up to 60 mins. The movement is shrouded in plastic and the click of the buttons is nasty in comparison. They seem to switch to this cheaper movement in 96/97 and use it to this day. Regardless of the movement they all keep time as well as my 7A28, roughly a half-second fast per day. These AquaChrono's are a bit chunky to wear with a shirt but the "metrosexual" stretchy bracelets are so comfortable The small chrono hands can get stuck when not used for a few years but can be revived by holding down the button in alignment mode. Movement of the hands (e.g. 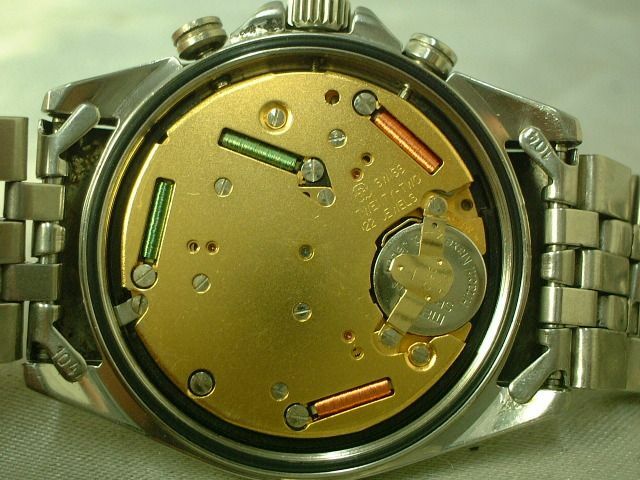 when resetting) is actually a lot quicker and crisper than Seiko. Swatch seems to be making fairly classy designs these days but far less distinctive and few are tempting enough for me to part with £100+ for one. Regardless of the movement they all keep time as well as my 7A28, roughly a half-second fast per day. 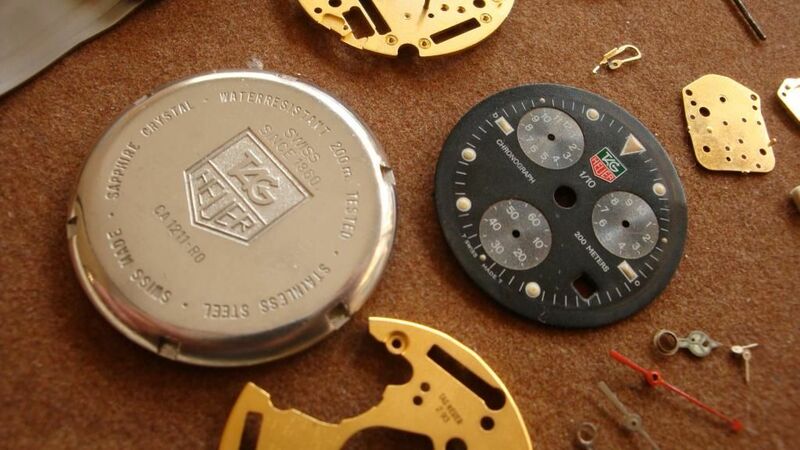 You could always tune that 7A28 to be more accurate, using the rotary step switch (increments of 0.26 secs / day). 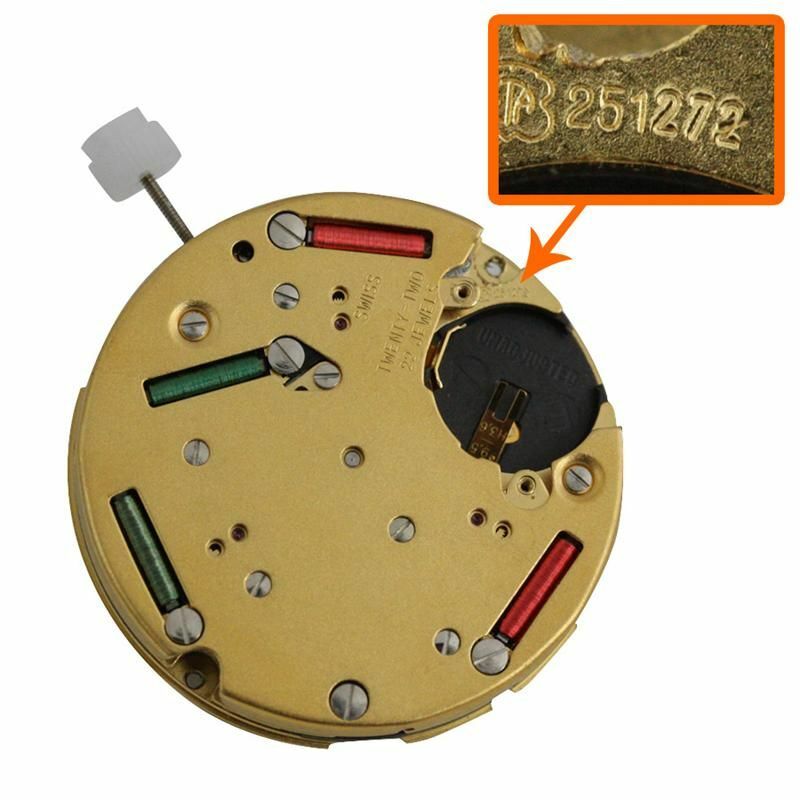 I haven't done any more research into them, but perhaps these ETA 251.262 movements are smarter than your average Seiko 7Axx. I was browsing TZ-UK yesterday and came across a thread where the OP was considering buying a 7A38. He's since joined the forum. 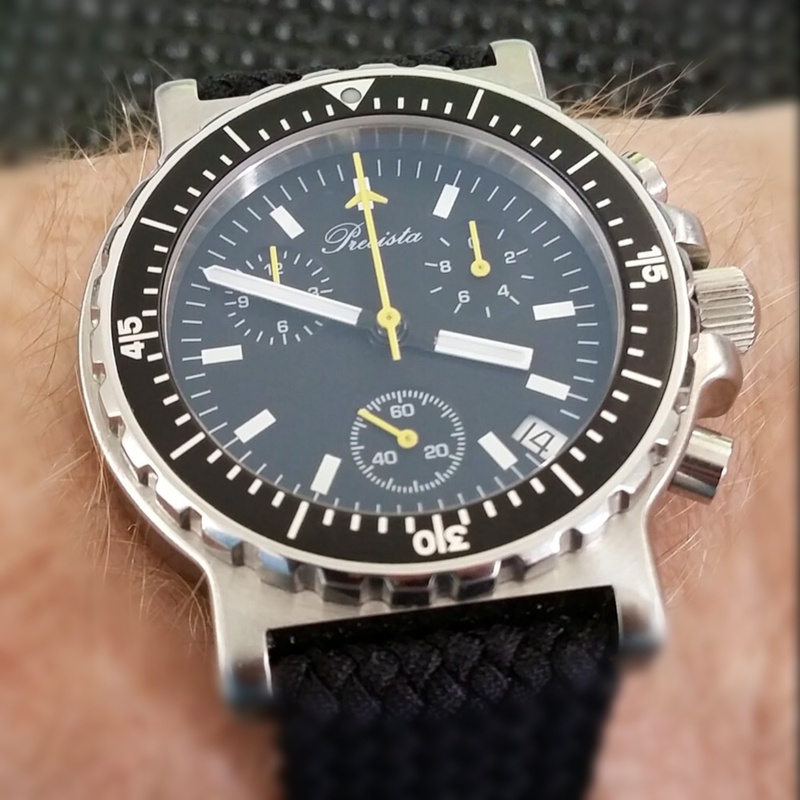 .... the fantastic ETA 251.262 quartz chrono (another legendary milestone movement in my book) - proof in the pudding of how handy this movement is this morning, clocks went forward, pull out the crown one click, little twist and hey presto watch set for another 6 months. So does this mean they have an in-built perpetual calender ? Thank you very much for the welcome. 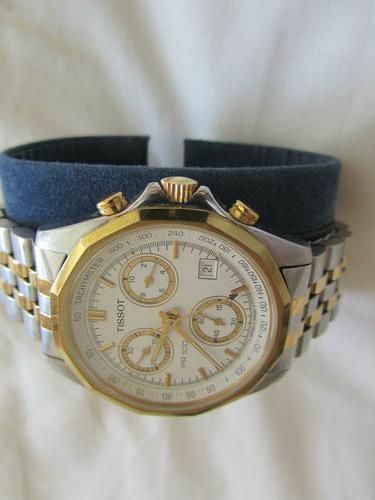 Great site to you have here, some lovely watches on display. As for the ETA, no there is no perpetual calendar, and as far as i am aware there is no quick set date. You do have a quick set hour, great for moving through time zones, and quite a quick way of changing the date when required. I do like the ETA's central minute register and 12 hour timing ability. 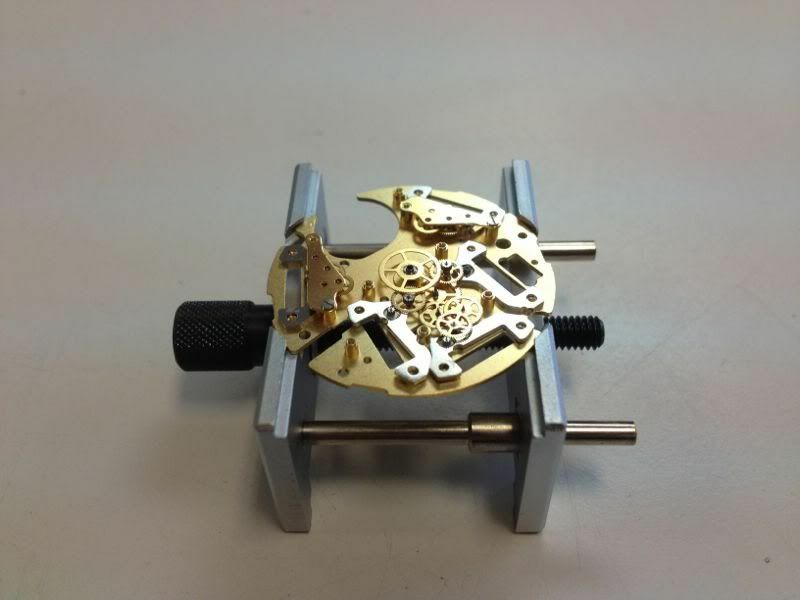 It certainly is a fine movement, but there is just something special about the 7A series. O.K., thanks for clearing that up, Nick. 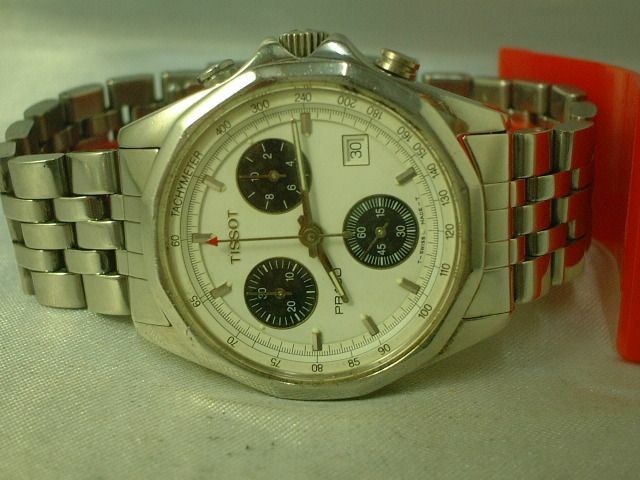 It was your phrase: "hey presto watch set for another 6 months" that confused me. I read that as your not needing to advance the date manually at the end of 28 day or 30 day months. 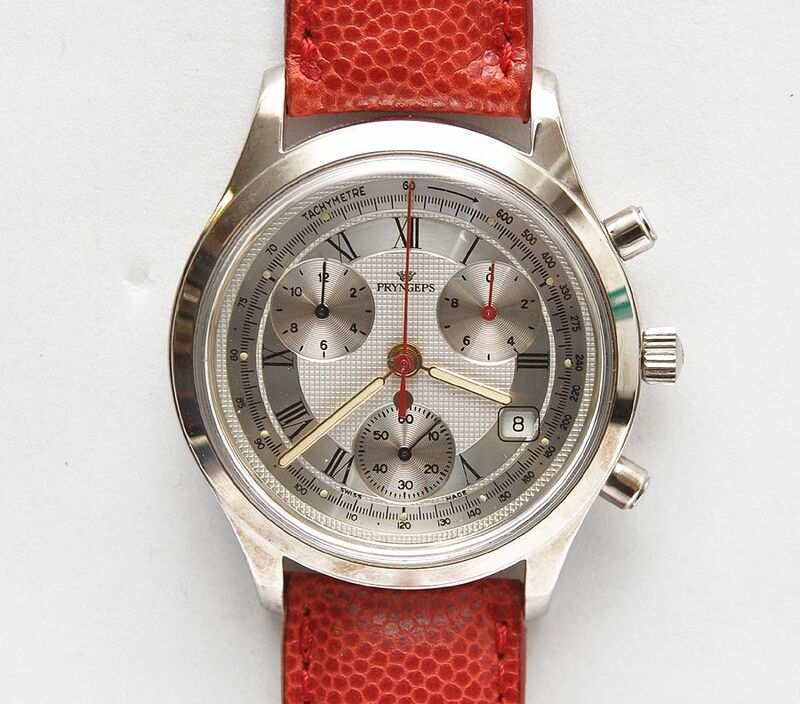 Here's my contribution; eta caliber 251-262 Hamilton LL Bean Chronograph. I've been waiting for years to find one. Missed out in 1990-1991 when they were in the LL Bean catalog for about $399. Finally found one on eBay last week. So far I love it. Date at 6 o'clock, 1/10 sec, a minute hand counter and 12 hour timing. The only problem is that I can't find the product number for it. H-xxxxxxxx ? I'm buffing the slightly domed crystal slowly with Brasso. Just received a Precista PRS-17c with the 251.252 calibre. I'll enjoy the manual for this I think!